I have this life philosophy to give up on small talk. To pretend like it doesn't even exist. Sure, it's a normal part of any civilized society, but I hate it. I loathe it. So much. It's awkward. It's forced. It's not genuine. And worst of all... it's not real. And I have this major issue with not being honest. Most of the time I'm too honest. It's like a disease. I just vomit all the thoughts and feelings and truth like someone is exorcising me. But, like I said, even though I hate it, sometimes it's necessary. When I'm standing in the grocery line, I can't exactly get into the deep, personal pain that the cashier's currently going through. I can't open up to my bank teller about the struggles I'm having and expect her to reciprocate. I can't even demand it of some of my friends. Some people are more comfortable with gentle small talk, than the harsh, abrasive, soul-pouring content of deepness. I'm probably not going to let you get away with it, but I do respect that you're not as comfortable diving deep as I am. I've been thinking about this over the last few weeks because I stumbled upon this meme and it stirred something up inside me. Isn't it a good one??? It's so sweet. So cliche. So... pop-culture-esque. Are you hearing the sarcasm....? Let's be real for a second, I disagree with this entire sentiment. I wholeheartedly disagree. And you guys, I love Morgan Freeman. I think he's a genius in his craft. But on this one thing, I completely and utterly disagree. Now, I did discuss this with my husband. And he doesn't disagree with Morgan. He disagrees with me. He says I'm taking it too literally. And I'm not considering the big picture. The world is not changed by one random act of kindness at a time. Random kindness is not the answer. Random kindness is nothing but... random. And besides, is kindness ever random?!? I know a little bit about human nature, and I don't think anyone's instinctive reaction to a surprise situation is kindness. In fact, human nature kind of demands the opposite. Selfishness. Unwillingness to change. Fear. Prejudice. Reluctance to see need and suffering and anything outside of our own problems and struggles. Randomness rarely accomplishes anything but chaos. Only instead of a chaos of kindness, which wouldn't be so bad, we are stuck in fizzling determination and a smattering of holes. Holes everywhere. Holes where people should step in with kindness. Holes that people should fill with love. Holes that need to get smaller and smaller and smaller until they disappear completely. Until we don't have a chaos of kindness, but a blanket of it. Until we have an all-encompassing, far-reaching, non-discriminating, one from every tribe and nation network of kindness. The world is not changed by one random act of kindness at a time. The world is changed by intentional kindness every moment of every day. Intentional kindness that doesn't quit. That doesn't stop. That doesn't get tired or bored or distracted or "hangry." Intentional kindness that stays intentional. And with its intention changes lives and hearts and turns them into legacies of more intentional kindness. Please understand that I'm totally not judging that meme. It's a great thought. And it's a sweet thing to say and post and pin. But as I look at my Facebook feed and see vitriol of hate after vitriol of hate... as I look around at this world where ISIS happens and Syria is happening and North Korea and Libya and our country is in this terrifying political turmoil, I just think it's not enough. It's not enough to be random with your kindness. You have to be intentional with it. It's not enough to be polite and politically correct with your love. You have to be persistent and determined with it. It's not enough to be hopeful with your goodness. You have to be relentless with it. You have to never quite. Never slow down. Never ever ever let someone or something stand in your way. Most Tuesdays, I work out of the Hy-Vee closest to my kids' school. I get the most work done there because it's only a minute down the road. I don't have to fight other working people for tables with outlets. And I like the people there. I feel like I fit into this misfit group of elderly that hang out there every single day. They've accepted me as one of their own. They all stop to chat and tell me about their lives. And they save me my favorite booth. Plus, I actually like their wi-fi. See? I've found writer's nirvana. Anyway, first thing in the morning the tables are filled with groups of older men. Some are there for Bible Study. Some are there waiting on their wives to finish shopping. And some are there to simply have a cup of coffee and some eggs and talk life. Here's what I've learned from old men: They have it together. At any table, you can hear conversation about all of the major subjects we're supposed to avoid in polite society. They talk money. They talk politics. And they talk religion. Nobody yells. Nobody gets offended. Nobody goes off on long tangents and angry rants and unfollows each other or hides each other or condemns them all to hell. And it doesn't matter that they all have different opinions or political loyalties or religious beliefs, because they listen to each other. They laugh with each other. And they respect everyone and everything they say. It is the most beautiful thing. I feel blessed to get to witness it. And witness it often. This is intentional. This doesn't happen naturally. It is not human nature to respect each other or to listen to another opinion and believe it's valid because all people have the right to their own beliefs. It's not, I promise you. If you don't believe me, I'll let you scroll through my Facebook Newsfeed where you can find all kinds of hate and hate speech. It's just not the point. Yes, this country is in a transition. Different parties are desperate to come out the winner and with them their loyal followers. But after all of this. After elections and political speeches and polls, there will still be humans out there that need our help. There will still be hurting people and broken lives and things that require our kindness. And I don't just mean refugees in other countries. I mean your neighbors. Your friends. Your waitress. That person answering your angry customer service call. Your family and kids and complete and total strangers. If I know one thing about humanity, it's that every single person has private pain. This world is too broken for it not to be this way. You're hurting. I'm hurting. Everyone is hurting. We've all lost and loved and lost loved ones. We've all been rejected, neglected and forgotten. We've struggled to adult. And to human. And to live. I'm not saying every person is depressed and wallowing in grief. But this life we live is hard. This life we live is painful. 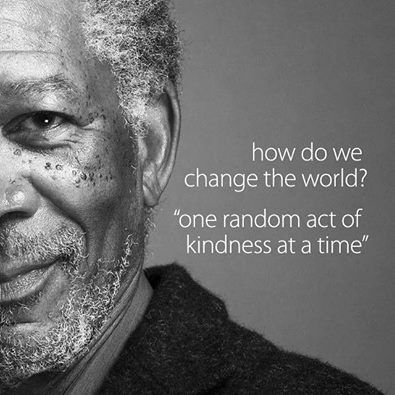 Kindness isn't random. Kindness is intentional. It has to be. Or we forget about it. Or we choose something else. I was recently reading a book by Matt Chandler and asked this question: Do the people you come into contact with have a soul? The answer is obviously yes. Every human being has a soul. But do we treat them as though they do? When your waitress brings your food out, do you stop and notice her soul? When the cashier is checking you out and there is a line of a thousand people behind you and everyone is cranky and tired and frustrated, does she have a soul? Do the people behind you? When your cable overcharges you... does the person on the other end of that tiresome phone call, have a soul? Does the idiot driver in front of you? Does your freshly sworn enemy that believes in a different presidential candidate than you have a soul? Yes. The answer is a resounding, echoing, permanent YES! We all have souls. We all have eternal souls. And they need our kindness. Especially them. Whoever them is. They all need it. They need our intentional kindness. Be aware. Be wide-eyed and respectful. Be intentional. And stop with the small talk. We don't have time for it. There is so much better out there. There is so much more worth your time and energy. And most of all... be kind.